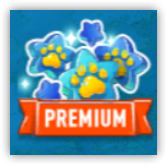 Premium is a set of bonuses that increase the amount of the awards received for playing in the Pet Park. You can find the Premium menu on the right side of the screen. What bonuses does the Premium provide? Twice the Star reward for completing orders in the Market! Pet Pageants are hosted twice as often! 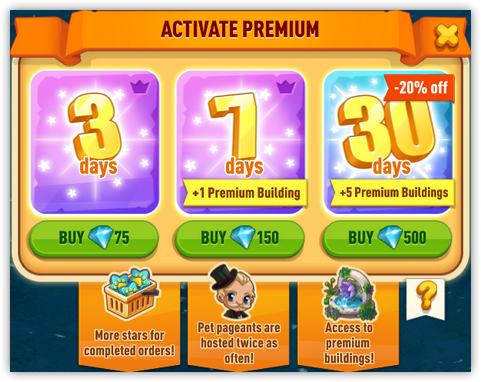 By purchasing 7 or 30-days Premium bundle, you will receive Premium buildings - special decorations for the Pet Park. 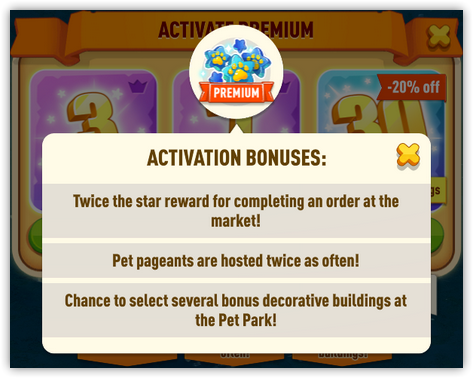 You can find more details in the section "How to decorate a pet Park?" (in the "Pet Park" article). Current bonuses received for the purchase of Premium can always be seen by clicking on the "More" icon (question mark) in the Premium menu. I want it! How can I get Premium? 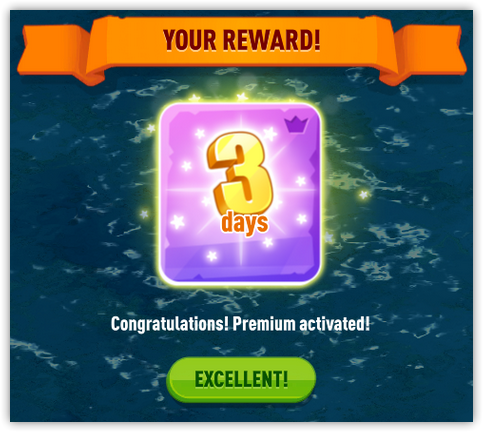 How long will the Premium be active? You can choose the Premium time-plan - get it for 3, 7 or 30 days. How long until my Premium is over? You can find out how much time is left by looking at the top-left corner of the screen. There will be an orange countdown timer above your account's icon.